On Saturday mornings growing up, mom would make a mound of pancakes for all of us. Her classic recipe always included smashed bananas in the batter, we came to know this as “plain” pancakes. She would ask “do you kids want plain or blueberry?” It may be a southern thing, but were raised on banana pancakes. 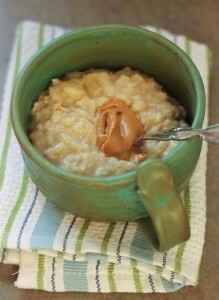 Our plain oatmeal is sweetened with creamy bananas too… oatmeal just doesn’t taste right without ’em. Is it a southern thing? Do you have to have bananas in your oatmeal too? Over medium high heat, combine all ingredients in a medium sized pot. As the liquid begins to heat stir the oats until the bananas are melted. 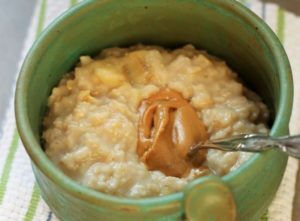 Turn heat to low and continue to stir until much of the liquid is incorporated and you have a creamy pot of oats. Enjoy with a spoonful of peanut butter and all of your favorite toppings. ha-ha 🙂 I`m not even American, but I always make my oatmeal with bananas, all creamy and packed with flavor. And I top it with fresh banana slices and peanut butter. On some days when I feel like indulging in some extra creaminess, I eat it with virgin coconut oil. Oh so good! I just made this and I have to say this is the best tasting oatmeal I have ever had. It is so creamy too!!! I love that there's no sugar added. It has never occurred to me to add PB – that was an excellent addition. I also added a small spoonful of Nutella. It was amazing! Thanks so much for this recipe! Thanks for your comments and I'm really glad you enjoyed it! I can't believe it, but I've never actually had nutella.. is that considered a foodie sin? Yummy oatmeal! 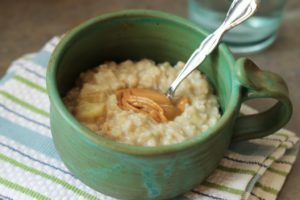 I love oatmeal, it's easy to prepare and very tasty. This looks delicious! Especially the peanut butter! it's so weird that bananas melt lol. this looks really good!! haha.. you are right! never thought about that. This is how I make my oatmeal every morning. It's not the same without bananas! Bananas and cinnamon are great in oatmeal! I love folding bananas into my oatmeal too – it's a sneaky fruit serving! Maybe it is a Southern thing after all! eating your fruit and don't even know it.